It's hard to get too worked up about dust. Yes, it's a nuisance, but it's hardly one that causes us much anxiety  and our language itself suggests as much. We call those clumps of the stuff under the bed dust bunnies after all, not, say, dust vermin. But there's a higher ick factor to dust than you might think. And there's a science to how it gets around  a science that David Layton and Paloma Beamer, professors of environmental policy at the University of Arizona, are exploring. The specific dust mix in any household differs according to climate, age of the house and the number of people who live in it  not to mention the occupants' cooking, cleaning and smoking habits. But nearly everywhere, dust consists of some combination of shed bits of human skin, animal fur, decomposing insects, food debris, lint and organic fibers from clothes, bedding and other fabrics, tracked-in soil, soot, particulate matter from smoking and cooking, and, disturbingly, lead, arsenic and even DDT. 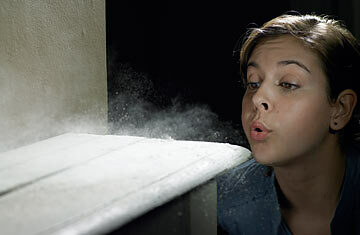 As a general rule, the majority of household dust  about 60%  comes from outside, through windows, doors, vents and, significantly, on the soles of your shoes. Smaller dust particles  from 28 to 49 microns, or thousandths of a millimeter  tend to stay on your shoes. The rest is shaken off inside. A higher share of the dust that floats in the air gets deposited, but again, there's a lot that determines how much any one home will get. There's not much to fret about in simple particles of dirt or organic materials such as pollen (though they can trigger allergies), but lead, arsenic and DDT can be a more serious matter. About one-third of the arsenic in the atmosphere comes from natural sources  volcanoes principally. The rest comes from mining, smelting, burning fossil fuels and other industrial processes. Even in relatively low concentrations, arsenic is not without risk, especially to small children who play on the floor and routinely transfer things from their hands to their mouths. The same is true for lead, which comes less from wall paint  the source most people would expect  than from auto exhaust, smelting and soil deposits. "Lead loading on floors is a key determinant of blood-lead levels in children," Layton and Beamer wrote in their paper. The mess that originates within the home is a lot easier to measure and control. The more people who live there, the more skin that's going to be shed, the more pets, the more animal fur. And, as Mom always warned, the more you walk around the house while eating, the more food debris you'll drop on the floor  which also attracts more insects that will die, decompose and add their own special zest to your dust. Cooking smoke and tobacco smoke, which are the most obvious contributors when they're being produced, actually make only a small contribution to what winds up on floors and surfaces. The tiny size of the particles makes them likelier to rise and adhere to other surfaces or simply remain in the air than to settle. It goes without saying that your home will never be dust-free, but there are ways to reduce your own dust loading  and it's important that you try. Dust mites, which feed on shed skin, produce allergens that are known triggers for people suffering from asthma. Same goes for cockroach dust, especially in cities. No one needs much convincing about the wisdom of getting rid of arsenic, and the good news is that about 80% of it can be removed simply by cleaning floor dust regularly. None of this means that dust poses a clear and present danger or that you need to take any extraordinary measures. Just clean regularly, don't smoke, eat at the table  and try not to freak out. Dust bunnies are still only bunnies; you may just want fewer of them. See the top 10 odd environmental ideas.